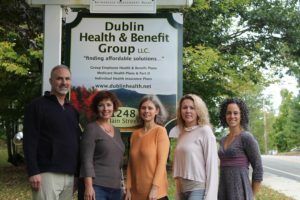 Dublin Health & Benefit Group LLC is dedicated to guiding businesses and individuals through the maze of New Hampshire health insurance and employee benefit options. By understanding your needs and budget we'll work together to implement a plan you feel is a perfect match. 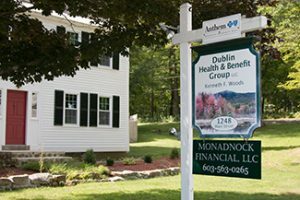 Dublin Health & Benefit Group, LLC represents you, our client, and all of the major New Hampshire health insurance carriers. Established in 2005, the Dublin Health team brings combined over 92 years of experience in the health insurance and employee benefit arena. It is no wonder we have become the financial professional's choice when it comes to referring their own clients! Each of our licensed brokers brings a heart of service and a desire to help you find the right solution quickly. Experience enables each broker to sift through the volume of choices offered and identify the value stories among them. This allows you to get back to your life comfortable with having found the right product from among so many and having left no stone unturned in pursuit of value! Insurance carriers come and go and rates ebb and flow. What is the right plan one year is no longer competitive the next. Dublin Health has become a constant in an industry where the only certainty is change. We offer access to carriers you know and trust. Purchasing health insurance, whether you are a business seeking coverage for your employees or an individual seeking personal protection for you and your family, is complex, expensive and downright frustrating to deal with. We guide you through all your options including those which may not result in a sale for our agency. The result is the best possible solution for you. Ken and his associates at Dublin Health made the transition from a group health insurance to Medicare quick and painless. Very knowledgeable in navigating the ins and outs of Federal vs Medicare replacement plans, helping us to find the best plan to suit our current needs. Highly recommended. Ken was a tremendous help during a difficult time in the change of my insurance status. I could not have navigated the many (yet few in NH) offerings, gratefully finding me newly established options to meet my needs. Ken, himself, is a kind and thoughtful businessman. Very professional, knowledgeable and well informed of any changes coming down the pike. Highly recommended, recently so, in fact!